You should notice that I have a new blog banner. I made it using the new My Digital Studio software that will be available for purchase starting October 1st! This software is absolutely wonderful for putting together those scrapbook pages in a flash, not to mention tons of other projects that can be made using it. 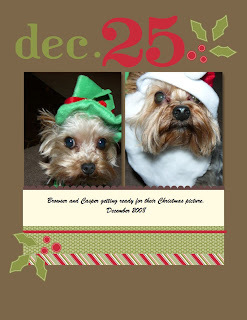 Here's one I did tonight with photos of my dogs from this past Christmas.